Go to one of the two stops on the campus-to-campus route. 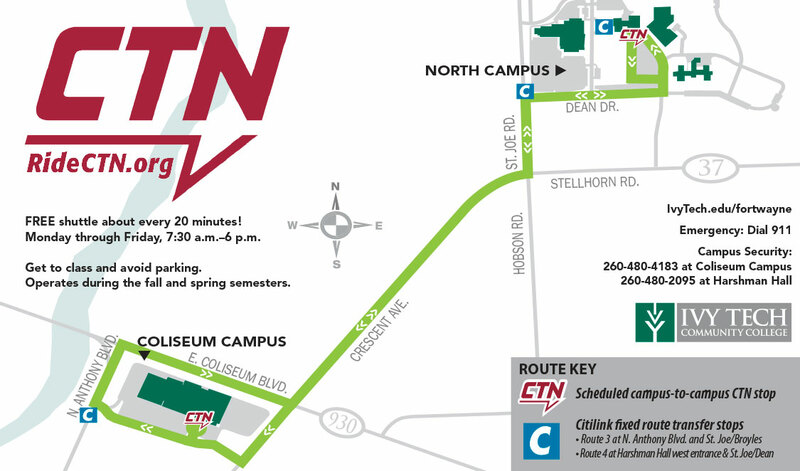 Shuttles arrive about every 20 minutes at Coliseum Campus and Harshman Hall on the North Campus (see the route map). Get on the shuttle. Shuttles are wheelchair accessible. Never cross in front of a shuttle. Find a seat. Always follow instructions from the driver. If no seat is available, you may need to wait for the next shuttle. In the roundabout on Ivy Tech's Coliseum Campus, in front of door 3. At the south entrance of Harshman Hall on Ivy Tech Fort Wayne's North Campus. 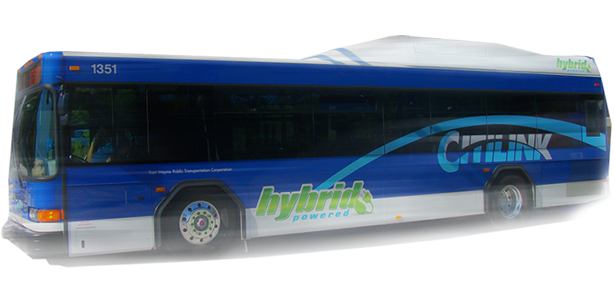 Since Citilink's fixed service (Routes 3 and 4) serves the Ivy Tech campus areas, it has agreed to continue providing 31-day passes to Fort Wayne colleges and universities at a 10 percent discount. For 2018-19, a 31-day unlimited trip pass is $40.50 with the discount (regular price $45). A valid student/employee College ID is required for the pass discount. A maximum of four (4) passes per person per semester can be purchased, and each pass will be active 31 days after its first day of use. Individuals should visit the Ivy Tech Bursar's Office in the Express Enrollment Center at the Student Life Center on the North Campus (3701 Dean Drive, Fort Wayne). Ivy Tech healthcare specialist students traveling from Coliseum or North campuses to the Parkview Education Center can connect from the shuttle to Citilink's Route 4 at Ivy Tech's North Campus stop at Harshman Hall. Riders will take Route 4 north and disembark at the Ludwig and Lima roads area, which is nearby by the Parkview Education Center (1919 W. Cook Road, Fort Wayne). A Citilink bus pass would be required. PROHIBITED WHILE RIDING THE SHUTTLE: Profanity or loud, abusive or disruptive behavior; consumption of alcoholic beverages; playing of any audio device without earphones; weapons of any kind or hazardous materials (gas cans, car batteries, etc. ); littering, destroying or vandalizing any property; and any other activity prohibited by law. Failure to respect any of these restrictions may result in removal from the shuttle.